Real Madrid coach Zinedine Zidane stated his admiration for Paris St Germain forward Neymar amid continuing reports in the Spanish media over a future bid to take the Brazilian to the Bernabeu. PSG, who face Real in the last 16 of the Champions League, plucked Neymar from Barcelona last August for a world record 222 million euros ($271.28 million)although despite his impressive displays on the pitch he has cut an unhappy figure at times. Real tried to sign Neymar when he was at Santos but were pipped to his signature by Barca and last month the club’s president Florentino Perez made a thinly veiled appeal to the Brazilian to join the 12-times European champions. “Being in Madrid would make it easier to win the Ballon d‘Or,” Perez said in an interview on Spanish radio. Real have lost two and drawn one of their last three league games and fallen 19 points behind runaway leaders Barcelona. Today’s game against Deportivo, who are in the relegation zone, offers the floundering European and Liga champions a chance of temporary relief from their crisis. 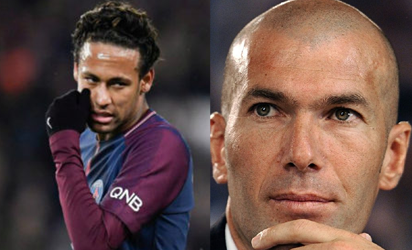 The post Zidane: I’ll love to have Neymar appeared first on Vanguard News.